There is nothing quite like cashmere and other woolens; so soft, so warm so welcoming. They keep the chill away and make you look good while doing it. Granted, right about now we are all really tired of this winter, pulling on the sweaters, dressing in layers, lacing up the boots, and braving the storm. I don’t know about you, but I simply cannot wait for spring. The fresh air, windows open, coffee outside on the porch, bare feet, blooms popping up, and migratory birds filling the air with their love songs. I can’t pack away my winter sweaters fast enough! Now we spend a great deal of money on winter knits, as well we should, they are an investment and if properly cared for, can last for years. We also then spend a lot on the care of these knits. 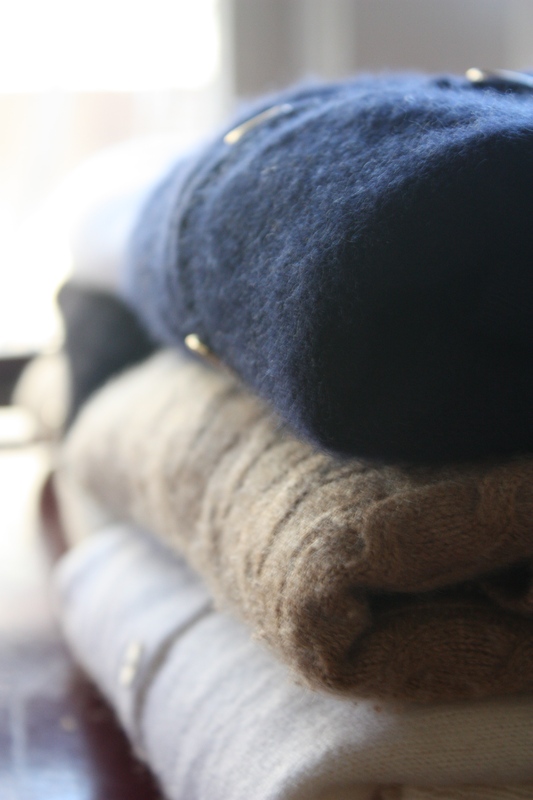 Most of you probably take your cashmere, angora, and merino to the dry cleaners. I mean, after all they are professionals. But did you know this is not the best way to care for your sweaters?! That there is a cheaper, better way to clean your cashmere? 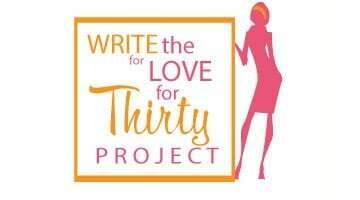 Well I am guest writing from Marcella Rose’s to tell you how! 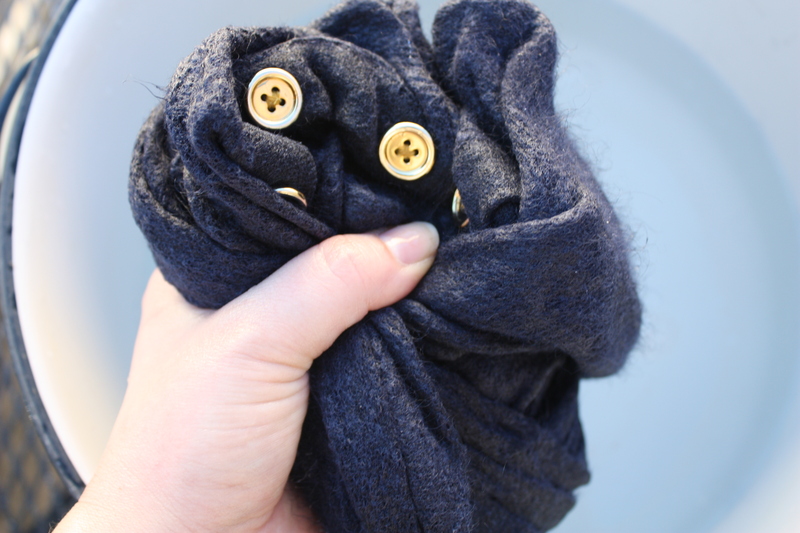 The very best way to care for woolens is actually to wash them. You’ll save the money and spare yourself the chemicals of dry cleaning, plus your sweaters will be softer to boot. Now you may be saying, “Marcella, the tag on my sweater says dry clean only.” The tag lies. With the new fancy washers that are out there now, you can even throw your sweater in a lingerie bag, wash on a delicate cycle with cold water, lay flat to dry and be set to go. But washing your precious sweaters in a washing machine is much harder on them, leading to shorter life span. I mean, you invested in these sweaters; it’s worth a little extra work to keep them around. That is why I prefer hand-washing mine. 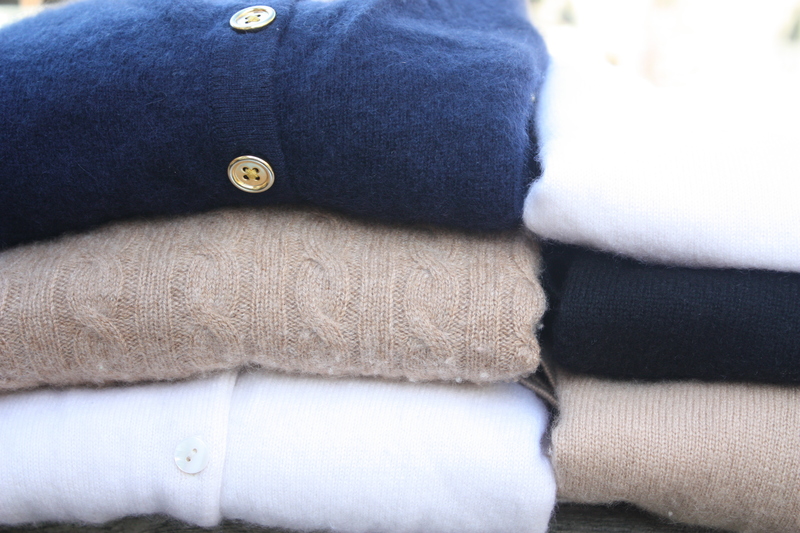 It really doesn’t take that long and the result is soft, luscious, heavenly sweaters. 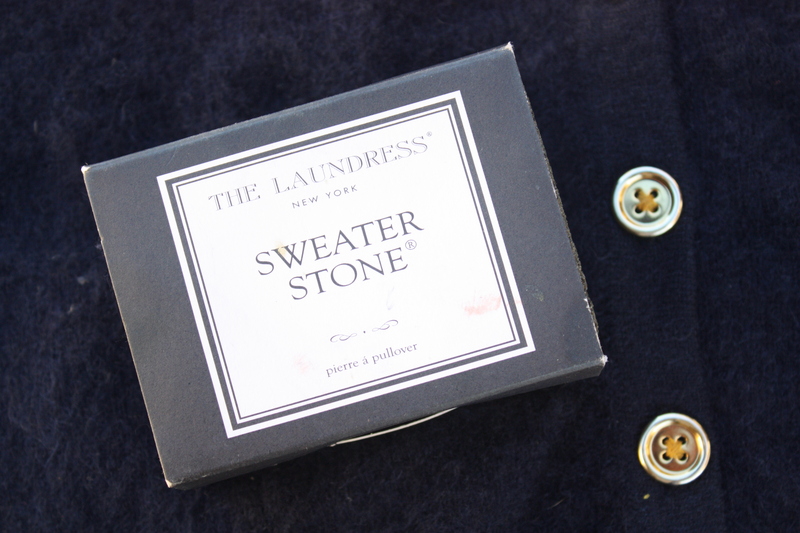 Before I wash my sweaters, I take a handy dandy “sweater stone” gently to them, removing any balls that have formed. Now some people block their sweaters and some don’t. I find that if I have a sweater that is a perfect fit I will block it, if it’s a looser sweater I won’t. Blocking is easy and if you keep a little journal in your laundry room you only need to do it once for each sweater. If you don’t want to block your sweater, just reshape it when you lay it flat to dry and you will be all set. 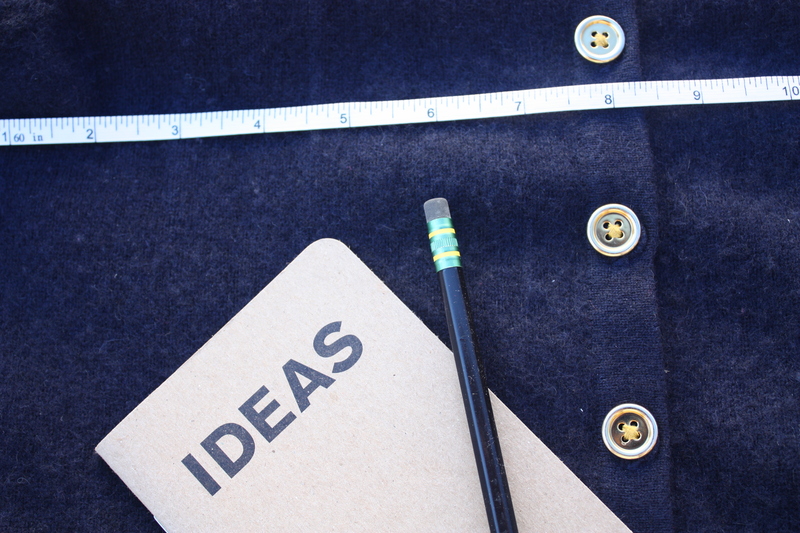 Draw a little image of the sweater and label it so you will remember what measurements go to what sweater in your little book you organized diva you! 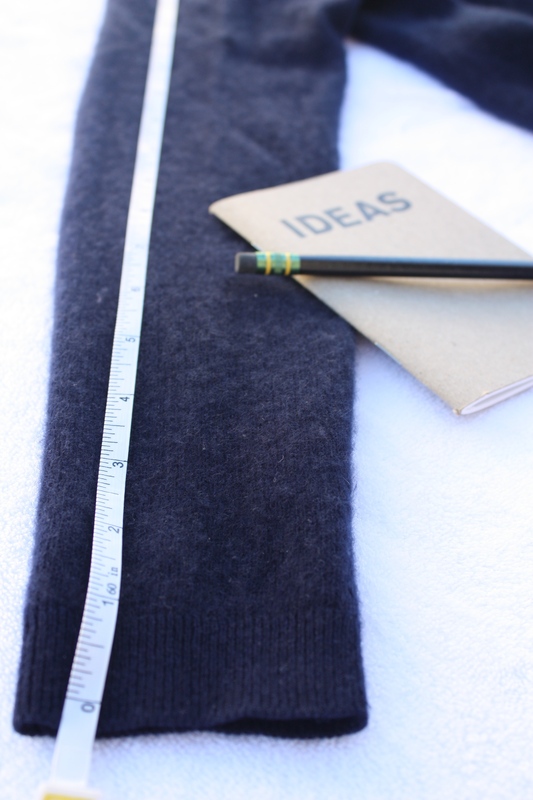 Once you wash the sweater and lay it flat to dry you will want to block it to these measurements, by gently coaxing the sweater into the same measurements and shape as before you washed it. Alright, it’s time to wash. You may have heard horror stories or even been the murderer yourself of a good sweater. It accidentally gets thrown in with your laundry, or your boyfriend decides to be romantic and do the laundry. It gets washed in hot water or tumbled dry and suddenly your $200 sweater is only fit (intentional pun here folks) for a toddler. But don’t let your sordid past make you anxious; you only need to remember these two things, heat is the enemy and easy does it. Fill a clean sink or washtub with tepid water. 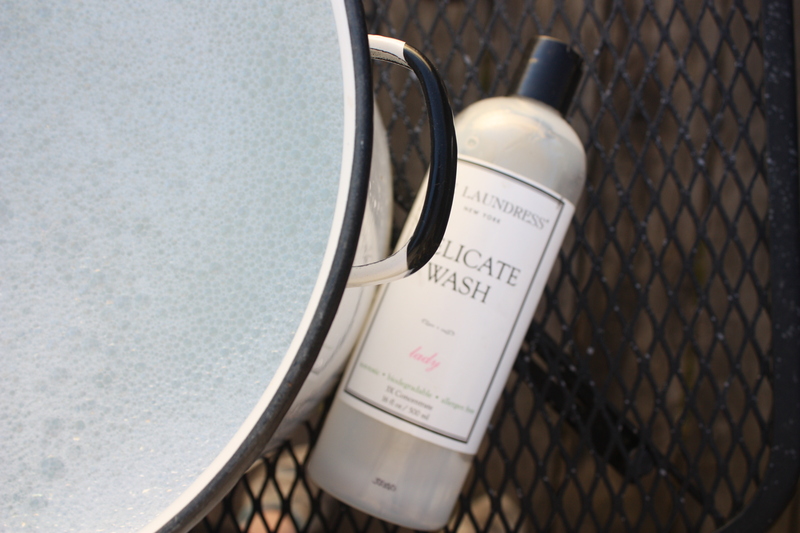 Add a dollop of gentle laundry detergent and mix with your hands, I like the Laundress brand. Add your sweater and gently swish around, don’t pull or wring a sweater as this will stretch it out. 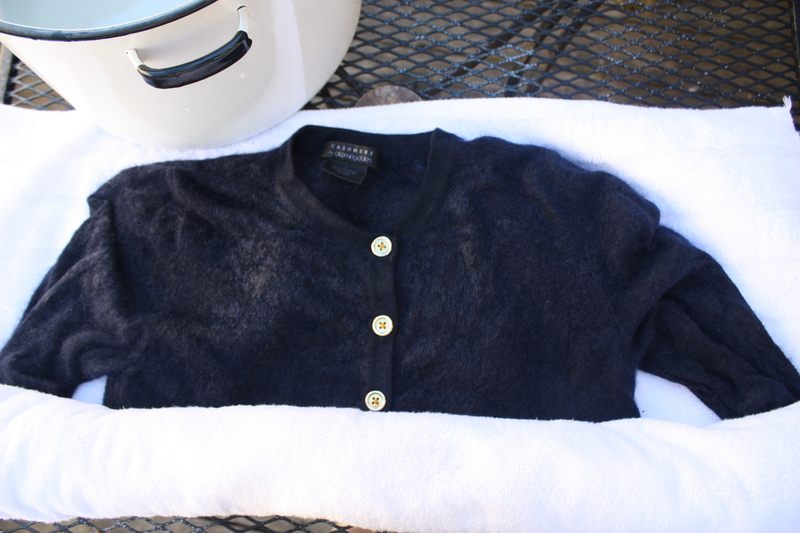 Ball up the sweater and squish it to remove the excess soapy water – don’t wring! 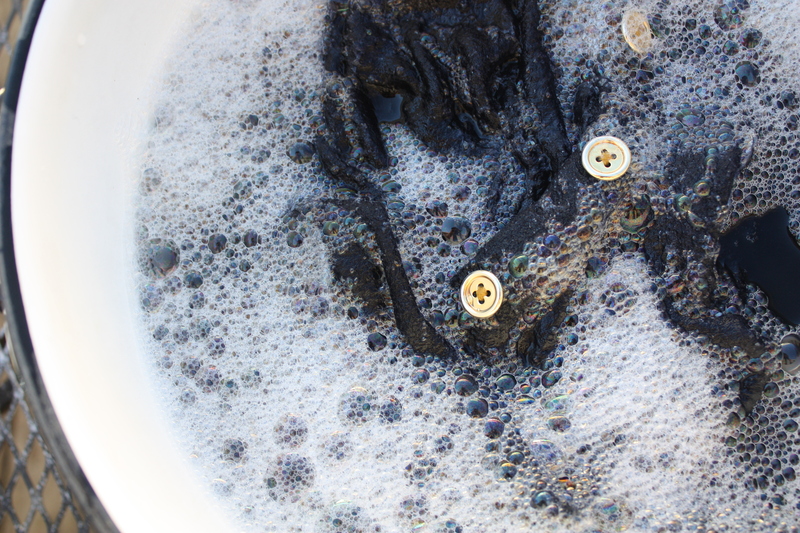 Discard soapy water and add fresh tepid water to washtub or sink. Put the sweater in the clean water, swishing to rinse – never put under running water. Repeat the last two steps until sweater has been rinsed thoroughly. After your last rinse, ball up the sweater and squish out the water. Roll up the sweater in the towel, pressing, to remove excess water. 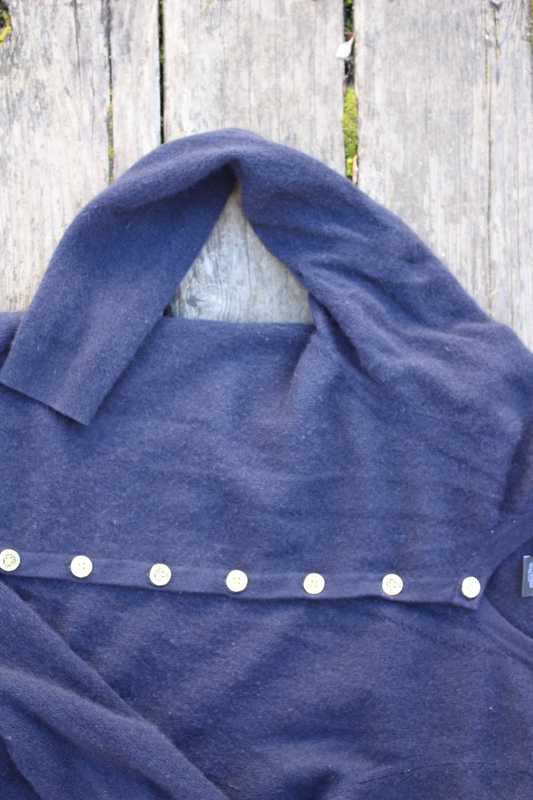 Lay sweater on a flat surface to dry – this can take a while with thick sweaters, flip if necessary. Steam or iron on low heat to remove any wrinkles. Fold to store, never hang sweaters as it causes them to stretch out. 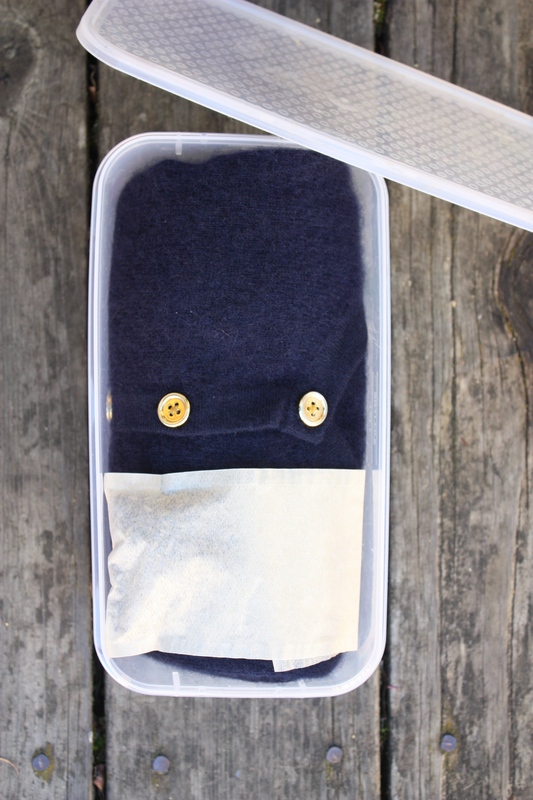 At the end of the winter season, I give all my sweaters this tender treatment, fold them neatly and store them in breathable plastic bins from the Container Store. I also throw in some dried lavender in a tea bag. 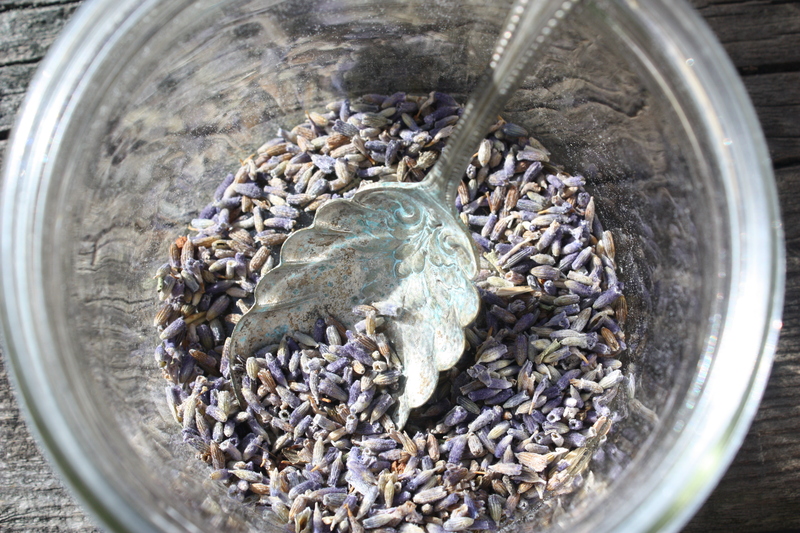 Lavender is a natural repellent to those pesky moths and it smells heavenly. Follow these steps and you will find your sweaters next season with no holes, fresh and ready to wrap yourself in when the air starts to turn chilly after the fall. To leaving sweater weather behind us!